Brazil nuts are technically seeds, not nuts, but their brown nut-like casings have led most people to call them nuts. They are produced by a South American tree which tends to grow in virgin rain forests, and they are an extremely popular food source in many Latin American nations, as well of the rest of the world. The nuts have a rich, creamy flavor which lends itself well to an assortment of dishes in addition to being tasty on its own. The tree from which Brazil nuts come is known as Bertholletia excelsa by most botanists. In good growing conditions, the tree can reach heights of 150 feet (45 meters), and it plays a significant role in rain forest ecology. The trees typically have straight, smooth trunks which open out to a branching canopy, and they drop their leaves during the dry season. Many animals interact with Brazil trees, including the agouti, a type of South American rodent which eats the seeds and hides others for later consumption. The hidden Brazil nuts sometimes develop into trees of their own, perpetuating the cycle. The trees are excellent illustrations of the complex web of interdependence which characterizes the rain forest. When they bloom, the trees produce complex, coiled flowers which cannot be penetrated by most pollinators. One species of bees likes the flowers, but it is only found in the presence of a particular orchid. Therefore, Brazil nuts will only be produced in rain forest regions which have this orchid. In turn, the tree relies on animals like the agouti to seed itself. In nature, Brazil nuts develop inside a large capsule which strongly resembles a coconut. If cut open, the capsule reveals a number of three-sided nuts. The nuts have extremely hard shells, but if they can be successfully cracked, they yield protein and fat rich seeds. Brazil nuts are considered a complete protein, making them an excellent addition to the vegetarian diet. Unfortunately, because of the high fat content of Brazil nuts, they can easily go rancid, and they should be kept in a cool dry place and eaten quickly. In addition to being marketed on their own as nuts, Brazil nuts are also pressed to yield oil. The oil is rich, creamy, and very flavorful. It can be used in cooking projects, and also has applications as a lubricant. It can sometimes be difficult to find the oil, but the nuts themselves are usually readily available in most markets. Like all the other types of nuts, Brazil nuts are also known for their great taste and health benefits. Besides being one of the richest dietary sources for selenium, a vital mineral for human health, it contains significant amount of magnesium, phosphorus and thiamine, and very rich in protein and dietary fiber. 28 g of Brazil nuts approximately contain 190 calories, out of which 170 calories can be attributed to its fat content. Out of the total fat, 5 g is saturated fat, 7 g is mono-unsaturated fat, and the rest 7 g is polyunsaturated fat. The protein content is about 4 g, while fiber and sugar contents are 2 g and 1 g respectively. Again, 28 g of Brazil nuts contain about 190mg of potassium, 4 g of carbohydrates and 0 g of cholesterol, trans fat and sodium. After having a look at the nutritional value of these nuts, it is not so difficult to get a fair idea about Brazil nuts nutrition. Most of the health benefits of Brazil nuts can be attributed to its high selenium content. Selenium is an important antioxidant that can protect from the harmful effects of free radicals. Free radicals are highly reactive particles that can oxidize and thereby, damage the body cells and tissues. Selenium can neutralize such free radicals and in the process, provide protection against a number of diseases including, heart disease. Selenium is also found to boost the immune system and promote the synthesis of glutathione, which plays an important role in minimizing free radical damage. Another important fact about Brazil nuts nutrition is that selenium is also required for the proper functioning of the thyroid gland. Apart from this, like other nuts, Brazil nuts can assist in controlling weight. High protein and fiber content of these nuts help to control hunger and thereby losing weight. However, people trying to lose weight should control their total calorie intake; consuming Brazil nuts only cannot assure the prevention of weight gain. Brazil nuts are a very rich source of omega-6 fatty acids that can lower the risk of cardiovascular diseases. Similarly, the mono unsaturated and polyunsaturated fats in Brazil nuts lower the level of cholesterol, and thereby reduce the risk for heart attacks and strokes. The benefits of these healthy fats often seem to outweigh the effects of small amount of saturated fats found in the nuts. 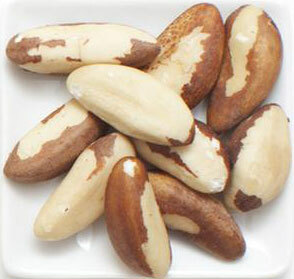 Brazil nuts can prove beneficial in a very rare inherited disorder, which is known as Acrodermatitis enteropathica. In this disorder, the body fails to absorb sufficient amount of zinc from the diet leading to zinc deficiency. Brazil nuts contain high level of zinc and hence can be helpful for anyone having zinc deficiency. Considering all the Brazil nuts nutrition facts, we can conclude that including a few of them in our daily diet can improve overall health and well-being. However, excess consumption should be avoided, as it contains a very high level of selenium. Presence of selenium more than the required amount in the body can cause fatigue, irritability and stomach upset. So, it is essential to maintain moderation in case of any food or dietary supplement. Moreover, it is better to use the unsalted or lightly salted nuts, as salted nuts means high level of sodium, which in turn is associated with hypertension. It is a well-known fact that dried fruits could be fattening if eaten too much. Therefore, there are certain factors that need to be considered before consuming Brazil nuts in large quantities, as researches have proved, there are certain side effects of these nuts. Our body requires very little selenium. The Institute of Medicine of the National Academy of Sciences advises a maximum limit of 45 mcg of selenium for kids and 400 mcg for adults daily. An overdose of selenium can be toxic and can cause brittle and white nails, hair fall, fatigue, rash, irritability and stomach upset. Brazil nuts have been found to consist high amounts of aflatoxins, which are carcinogenic, hence European Union has placed strict restrictions on import of Brazil nuts. Small amounts of radioactive radium is also found in Brazil nuts because of its vast root system. It is a thousand times more than that is found in other foods but is not believed to be absorbed into the body. In order to start consuming nuts in a healthy way, it is a great idea to combine small quantities of various types of nuts and dried fruits while eating. For example, instead of having a handful of Brazil nuts on Monday, a handful of walnuts on Tuesday and a handful of almonds on Wednesday, you could have 2 of each of the above daily or 4 times a week. It may be a good option to look for organic Brazil nuts as these are naturally produced and less processed. People allergic to nuts should refrain from consuming them. The relatively high percentage of polyunsaturated fats in these nuts (34 percent) causes the shelled ones to turn rancid fast. So it is best to store them in the refrigerator. Nuts roasted in oil and salted nuts are high in calories and should be avoided. To gain maximum benefits of consuming Brazil nuts, it is good to consume them unsalted. Shelled Brazil nuts in their basic natural form are safer and healthier. You can also use chopped Brazil nuts in cookies, cakes and other desserts. After reading the article, are you wondering whether Brazil nuts are healthy for you? It is a very good habit to consume all food items in moderation and same goes with Brazil nuts. Well, there are a number of health benefits of eating Brazil nuts, but remember to have just a few of them on a day as over consumption can lead to toxicity and over weight. It is recommended to have a few Brazil nuts twice or thrice per week.